The selection of “The Study of the Year” is organized by the World Federation for Chess Composition and aimed at introducing a single friendly endgame study to the general public. The study should appeal to chess players of various levels and encourage them to pay more attention to endgame studies. Composers were invited to submit a single study (either their own or by others) that was published (either in a magazine or in an award) during the year 2012. 1…Ka8 2.Ra7+!! 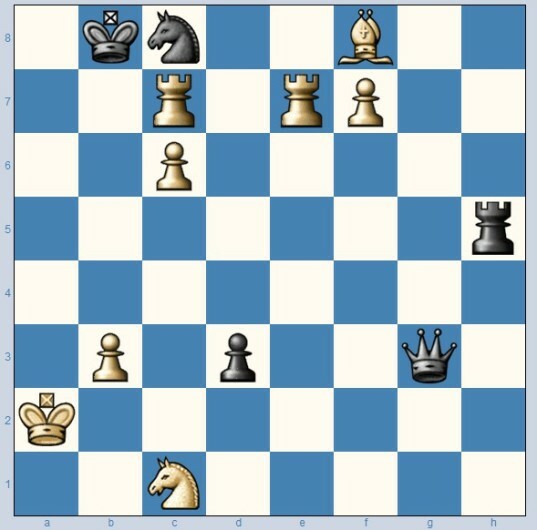 Nxa7 3.Re8+ Nc8 4.Rxc8+ Ka7 5.Bc5+! Rxc5 6.Ra8+!! 11.Qc6+ Ka7 12.Kxc1 Qh3! 13.c8N+! The is a study with a mutual Phoenix theme: both the black and the white knight are captured and reborn on the very same squares!